We describe eight polymorphic microsatellite loci for the proboscis monkey (Nasalis larvatus). These markers were tested with 33 samples, collected from Sabah and exhibited a mean of 6.25 alleles per locus and a mean expected heterozygosity of 0.674. All but one locus were in Hardy–Weinberg equilibrium, and no evidence for linkage disequilibrium was detected between any loci. Another 30 loci were isolated but remain to be fully examined. 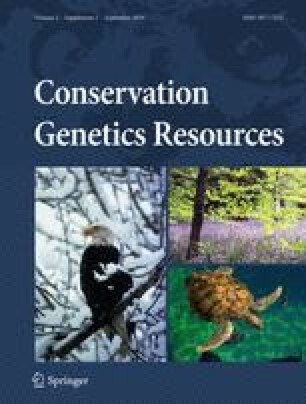 These markers should be useful for the future study of population genetic diversity and genetic structure in this emblematic species. This work was supported by CONACYT (Consejo Nacional de Ciencia y Tecnología- México), Rufford Small Grants for Nature Conservation, and North of England Zoological Society. We thank Dr. XiangJiang Zhan, Dr. Patricia J. Faria and Dr. Eddie Brede for their valuable suggestions on the laboratory work and colleagues at Danau Girang Field Centre and the Kinabatangan Orangutan Conservation Project for their help in the field. The authors are grateful to Lok Kawi Wildlife Park, Sepilok Rehabilitation Centre and Dr Henry Bernard, of the Unit for Primate Studies at the Institute of Tropical Biology and Conservation of Universiti Malaysia Sabah, for providing some of the samples used in this study.